Acclaimed as a solution to domestic energy needs and stocked by DIY stores, wind power use has increased massively in the last 5 years. The total number of small scale wind turbines (0-1.5kW) installed in the UK rose from 862 in 2005 to 23,708 in 2009 – with annual growth at 80%*. Its attraction is that apart from PV it is one of the few ways to directly generate electricity. It may seem obvious, but the most important point to think about is wind. If you don’t live in a steadily windy area with space to build a turbine well away (say 20metres) from buildings, trees and uneven ground, then wind power is probably not the solution for your home. There are lots of complications in built up areas as air travels over, around and between buildings, so a wind turbine in these circumstances must be robust enough to cope with the turbulence. This is more suited to a vertical axis wind turbine which are well balanced, and (according to the manufacturers) have lower levels of vibration and bending stresses to transfer to walls or roofs. Even so they may need to project considerably higher than your ridge to be effective, it is not a lever arm that we would recommend be attached to your house in a storm. Wind turbines will inevitably cause some noise, so if your neighbours object the council will be extremely unlikely to allow planning permission – it may be worth asking them first. 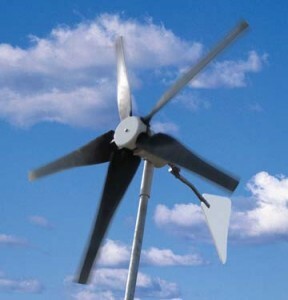 In a more rural setting – perhaps a group of houses could lco-operate to install a larger, more community based project, if so a turbine could be a good answer. 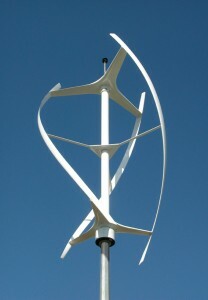 The Centre for Alternative Technology has tested small turbines over many years and is a good source of information. There is grant funding available if you can set up a working system.